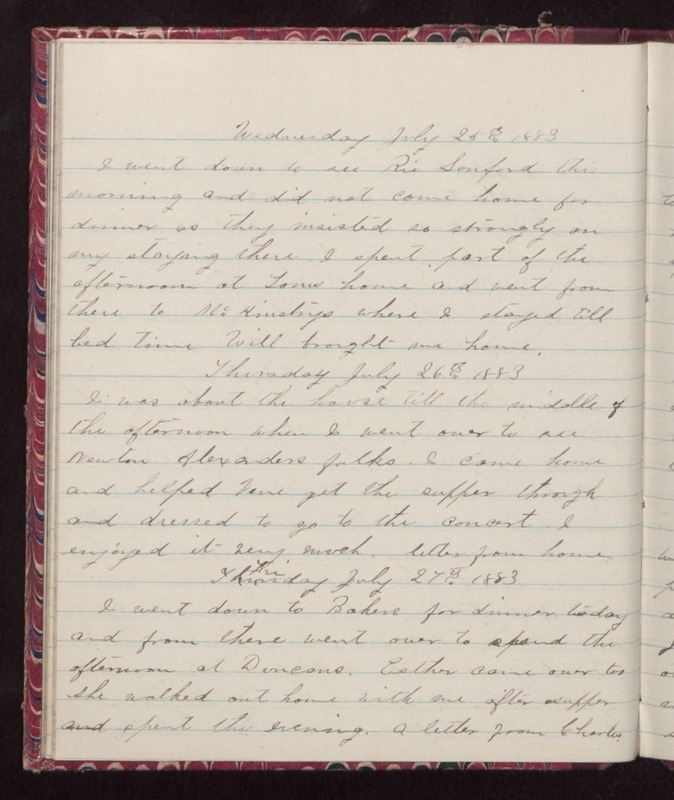 Wednesday July 25th 1883 I went down to see [Rie?] Sanford this morning and did not come home for dinner as they insisted so strongly on my staying there. I spent part of the afternoon at Toms home and went from there to [McKinstrys?] where I stayed till bed time. Will brought me home. Thursday July 26th 1883 I was about the house till the middle of the afternoon when I went over o see Newton Alexanders folks. I came home and helped Vene get the supper through and dressed to go to the concert. I enjoyed it very much, letter from home. Friday July 27th 1883 I went down to Bakers for dinner today and from there went over to spend the afternoon at Duncans. Esther came over too she walked out home with me after supper and spent the evening. A letter from Charles.